The Dielette Guernsey ferry route connects France with Guernsey. Currently there is just the 1 ferry company operating this ferry service, Manche Iles Express. The crossing operates up to 5 times each week with sailing durations from around 1 hour 10 minutes. Dielette Guernsey sailing durations and frequency may vary from season to season so we’d advise doing a live check to get the most up to date information. Dialette is a port located in the coastal town of Flamanville in the Normandy region of north western France. The port is around 75 km from Saint-Lo and 315 km from Paris. The quint port is the ideal gateway for visitors to the region travelling from Guernsey and Alderney, in the Channel Islands. Located close to the port are some hotels and restaurants. This small port, in the heart of Norman agricultural country, the land of cider, Calvados and Camembert, is been developed in recent years into a busy marina. Upper Normandy (Haute-Normandie) is made up of the French departments of Seine-Maritime and Eure, and Lower Normandy (Basse-Normandie) of the departments of Orne, Calvados and Manche. In the past, the province of Normandy was made up of the present day Upper and Lower Normandy along with small parts of the department of Eure-et-Loir, Mayenne and Sarthe. Normandy derives its name from the Viking settlement back in the 9th century which was confirmed by treaty in the 10th century. Following the Norman Conquest of England in 1066, Normandy and England were linked by Norman and Frankish rulers for 150 years. During the summer a high-speed passenger ferry is operated from Dialette to Alderney and Guernsey by Manche Iles Express. The island of Guernsey lies in the English Channel and is located around 50 km to the west of the French Normandy coast. Guernsey is one of the Channel Islands and is a possession of the British Crown. Perhaps the island's biggest draw for visitors is its coast and beaches, with over 27 different bays to explore and enjoy. Some are more popular than others and the island's beautiful south coast is characterised by stunning cliffs and are best explored on foot. The island's port is located in St Peter Port is one of the prettiest in Europe and provides a lovely backdrop when arriving at the island by sea. Ferries arriving in Guernsey depart from a number of ports on the English south coast with crossing times from 3 hours. Ferries from Portsmouth operate all year round and in all weathers whilst ferries to St Malo in France take a little more than 2 hours. Additional ferry services are put on during the busy summer months from the Normandy coast. 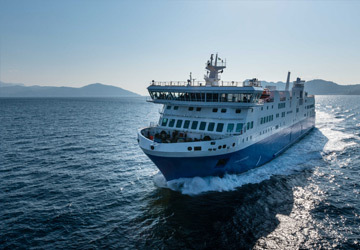 As a foot passenger, or if travelling with your car, motorcycle or bicycle, the ferry will deliver you straight into the heart of the island's capital.